Let’s cut to the chase: the 65-inch B7 was the best value 4K TV in the current (ie: 2017) LG OLED line-up. Positioned as it was below the C7, G7, E7 and W7 models, it shares the same panel and image processing technology as its more expensive stablemates. Today there are only two caveats to that: the LG OLED65C7, which is all but identical but has slightly better audio capabilities (although like the B7, it's best paired with a soundbar or other external audio box), can now be had for the exact same price. And also, LG is primed to release a new range of TVs which will probably be more expensive, but which certainly will be even better. But hey, that's tech. The B7 may be a relatively cheaper OLED proposition, but it’s still a fine looking specimen. The slim silver bezel is reassuringly premium, the shiny finish contrasting nicely with the white plastic casing. A stylish crescent stand adds a touch of style. Perhaps the key point here is that the OLED B7 range looks better than its near-twin the C7. Yes the C7 has slightly better sound, but it also still needs a soundbar to really give top-class results, so it's the looks that give the B7 the minutest of edges, for me. This review is specifically about the LG OLED65B7 which uses a 65-inch panel. 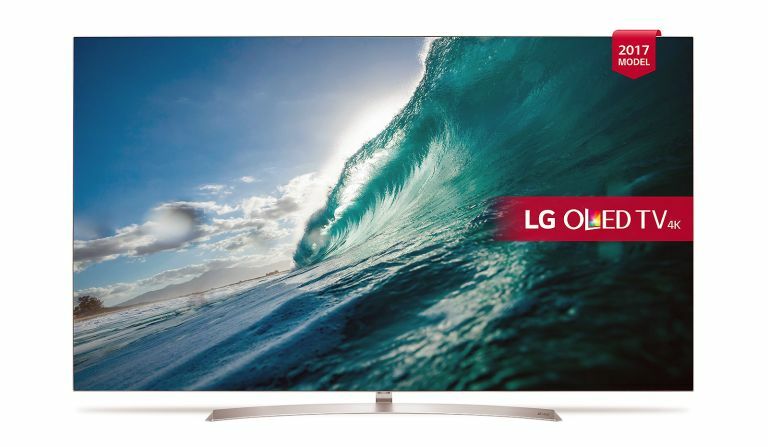 The only other model in the range is the LG OLED55B7 which is 55 inches across and every bit as good, although smaller. It's also cheaper, of course. Offering deep, authentic black levels, excellent shadow detail and vibrant wide colour, the B7 is a joy to watch. Perhaps the big surprise is the leap in HDR performance it has over previous generations of LG OLED screens. This set is capable of bright spectral highlights which really add depth and dynamism to its images. There’s plenty of HDR flavour support too. In addition to standard HDR10, there’s HLG HDR and Dolby Vision. Netflix original movie Okja is a great example of the beauty of Dolby Vision. Early scenes of the titular super pig meandering through the South Korean forest, dappled by bright sunlight, look superb. The texture on Okja's hide and the depth in the landscape is highly impressive. There’s also a Technicolor HDR setting and the brand’s own Active HDR technology. The latter inserts dynamic metadata into static HDR material on a frame-by-frame basis, to better manage HDR image processing. It’s debatable just how effective this is, but I’ve rarely seen Mad Max Fury Road (4K UHD Blu-ray) look better. There's searing heat in the bright sunlight, and when Max hurtles into the sandstorm early on, lightning bolts crackle with peaky luminance. Detail is uniformly high, although Sony’s A1 and Panasonic EZ952 probably edge the set slightly for outright crispness. For the best possible 4K image clarity, ensure that Just Scan is turned to On in the Aspect Ratio menu. For the smoothest sports performance, set Trumotion to Clear. This doesn’t incur much in the way of motion artefacts, and keeps pans judder free. For movies, I recommend switching Trumotion off completely. But everyone knows that, right? One clear differentiation between the B7 and its pricier stablemates is audio performance. The B7 employs standard down-firing stereo speakers which can kindly be described as functional. Of course, this isn’t a concern if you intend to use the TV as part of a larger AV system, ideally partnered with a Dolby Atmos AV receiver or soundbar. The set actually has a Dolby Atmos decoder onboard, which means it can decode Atmos audio on select Netflix shows and then bitstream it out over HDMI to an external sound system, giving genuinely immersive 3D audio. There’s no shortage of niceties onboard the good ship B7. LG’s webOS smart platform remains arguably the slickest connected TV platform in town and there’s a full complement of streaming services available. The interface is highly intuitive, yet easy to customise. In addition to Netflix, Amazon Video and YouTube, all of which stream in 4K, you get Now TV and a full house of mainstream catch-up, courtesy of the Freeview Play tuner. You can even use webOS to view 360 degree videos on YouTube, navigating wraparound videos with the supplied Magic Remote control. Nothing on the box? Use this OLED screen as a wall art, via the OLED still image gallery. Connectivity comprises four HDMI inputs, all HDCP 2.2 compatible, plus three USB inputs, one of which is a fast v3.0 for timeshifting to an external USB hard drive. There’s also a digital optical audio output and Ethernet. Wi-Fi is standard, naturally. The set comes with a single remote, the latest version of LG's cursor-based magic Remote controller. It’s 2D only. 3D compatibility has been given the heave-ho. Given the B7’s performance and functionality, both the 65-inch monster and its 55-inch mini-me are HDR steals. The B7 is a damn difficult OLED to resist. The feature slate is first rate and its webOS smart platform is a treat to use. The fact that it shares the same picture processing engine as more expensive 7-series LG OLEDs is more yet icing on the cake. In short, this big OLED is brilliant, and it’s a bargain. That’s not something we get to say everyday.